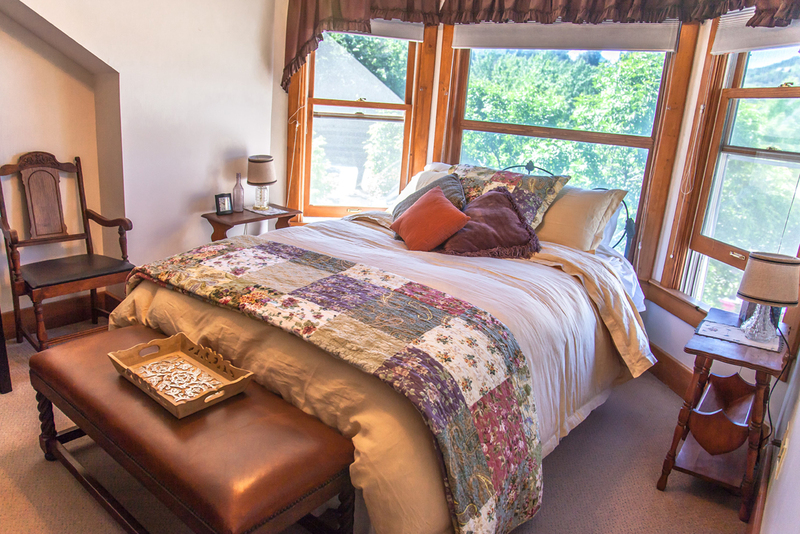 A welcome warmth of this historical home away from home awaits you at the Bross Hotel Bed & Breakfast. Located in the center of downtown Paonia, close to Delta, Colorado, you’ll find that this century-old hotel still offers the best lodging available in the area. Rooms are furnished with antique furniture and adorned with luxurious bedding and decor. All rooms have private baths. Individual thermostats in each room offer temperature regulation. In summer, air conditioning is provided, ceiling fans, and the old-fashioned transoms above bedroom doors. Wi-Fi can be accessed throughout the property. 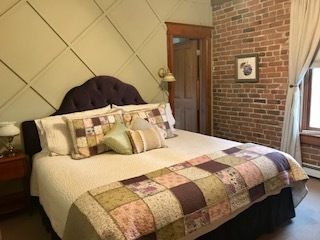 Each room at the Bross Hotel Bed & Breakfast is unique, bringing historical and modern technologies that are harmoniously blended for your comfort. Kevin & Karen Kropp, the owners/innkeepers, are local organic fruit growers and this is reflected in the rooms. They are named for a local fruit of the area and the artwork within each room gives you a taste of its flavor. Choose whichever room is to your liking and then come again to experience a new flavor! 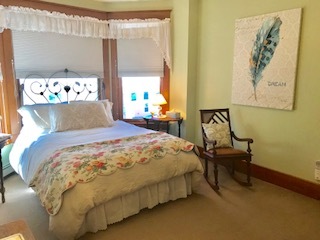 Reminiscent of a historical bed & breakfast, this room has a double bed topped with a matelasse’ quilt that reminds one of the beautiful springtime Cherry blossoms. The pictures on the walls also reflect the local cherry orchards and their enticing flavor. The bath facilities are split, with the wash bowl in one corner of the room while the shower and toilet are tucked into a small bathroom. 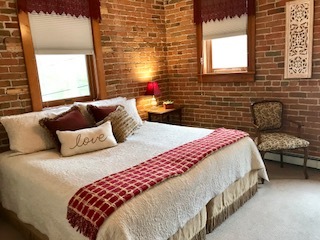 Located on the southeast corner of the building, The Sweet Cherry Room has a window overlooking the front balcony and another facing the main part of the town. Need a family suite? This can be connected to the Peaches & Dream Room. Join the charming surroundings in this enticing bay-window room. Located on the south side of the hotel, it’s a soft, and enchanting space. This room features a queen-size bed and a full bath. It’s an excellent choice as part of a family suite, or for the business person desiring a desk. 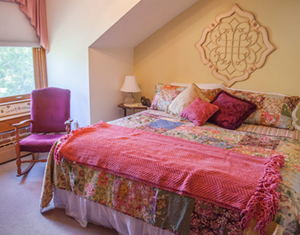 The Sugar Plum room offers a warm and relaxing atmosphere. The king-size bed with a beautiful plum tufted headboard can be split into twin beds. The room also features a full bath. 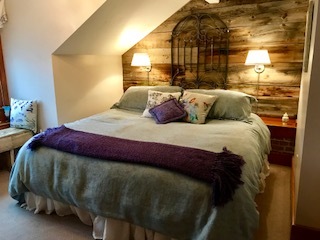 Soothing brick walls lend to the Wild Raspberry room theme well! This room provides serenity for the tired traveler. This northwest corner room exudes warmth and comfort with its raspberry décor. A desk makes it ideal for the business traveler. 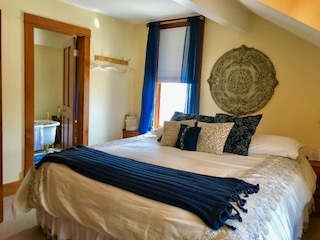 The room has a full bath and a king-size bed that can be converted into two twin beds. A variety of colors lend itself well to the beautiful Apple Blossom room. You can almost smell the fragrance of the blossoms in the room! In addition to a king-size bed, this room also contains a daybed, making it a good choice for parents traveling with a child. Or, they can be configured as three single beds. The room also has a full bath. Enjoy the luxury of the Perfect Pear Room. Decorated in a beautiful duvet comforter, you may never want to leave your room! The room boasts a king-size bed (which can be converted into two twin beds) with a large bathroom featuring one of the hotel’s original claw-footed tubs. Sink into a tub full of bubbles for a relaxing soak while enjoying the cottonwoods just outside the window. This is luxury! We brought the fun of the vineyard to the Bross! 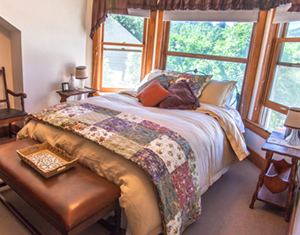 This third-floor, bay-window room will give you a taste of the local vineyards of Paonia. 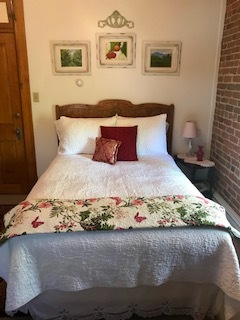 The Grapevine room offers a queen-size bed in the bay window and has a neat appearance with its maize colored duvet and beautiful Amish quilt accent. A desk provides work space for the traveler. The private bath features a large shower stall. The Grapevine Room can connect to the Perfect Pear Room, forming a family suite, if desired. I found my thrill on Blueberry Hill! 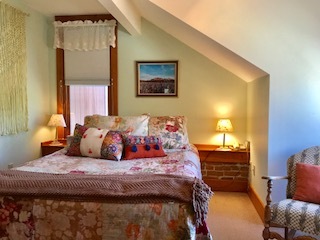 This king-bedded room is tucked under the eaves, but is brightly lit by a large dormer window. It is the perfect venue for the luscious blue and purple colors that enhance the blueberry theme. The décor is strong yet peaceful. The private bath offers a large shower. The king-size bed can be converted into two twin beds. The delectable Apricot Bliss Room! This third-floor queen room under the eaves of the building’s northwest corner has a sunny nook and windows looking out both directions. There is a beautiful macrame’ wall hanging that graces the decor and adds to the ambience. A sitting alcove lends itself to a quiet reading spot and is a perfect room for your romantic getaway. The private bath features a shower stall. 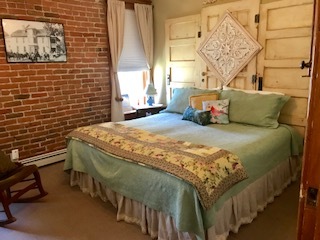 The Honeysuckle room is an incredibly inviting room that has a large dormer window and a king-size bed that can be readily changed into twin beds. Beautiful pictures and a colorful quilt give this room a cozy and special atmosphere. A shower stall is featured in the private bath. Some suites can be adjoined; call for details. King, queen, and long twin-size beds are all available. Tax of 9.8% is additional, and rates are subject to change without notice. Confirmed reservations remain as stated in the confirmation email. Reservations at the Bross Hotel B&B require a deposit of one night to confirm your reservation. If staying only a one-night, full payment will be required at time of booking. We will confirm your reservation by email. For your convenience, we accept MasterCard, Visa, American Express, and Discover cards and cash. Balance is due upon arrival. A refund is given less a $25 cancellation fee if canceled outside 7 days. If canceled within 7 days and we are able to re-book your room, a cancellation fee of $25 per room is charged. If canceled within 7 days, the stay is shortened, or there is an early check-out and we are unable to re-book your room, you remain responsible for your reservation. No-shows will be charged the full price. The room is yours for the entire time reserved. Any deposit previously made will be forfeited, and full payment will be charged. Holidays and groups require a notice of 30 days for cancellation. We understand that almost all of our guests who cancel do so for legitimate reasons; nevertheless, we must uphold our policy evenly and across the board without judging whether one guest’s reason is more valid than another. If you leave an item in your guestroom, please give us a call. We believe your things belong to you, and we will gladly send the items to you via UPS or US Postal Service. The shipping amount plus a $5 handling fee will be charged to your card. Bross Hotel B&B is not responsible for lost or stolen items. We welcome all Bross Hotel B&B guests and encourage their full use and enjoyment of the inn and grounds. We have gone to great lengths to provide a safe facility and a pleasant environment for all who stay here. In return, we also expect the respectful use of those facilities. Destruction or damage of Inn property, intentional or accidental, will result in charges to your card to cover proportional or full replacement costs. Bross Hotel B&B will not be held responsible for any accidents, injuries or illnesses that occur while on the premises or its facilities, nor will they be responsible for the loss of personal belongings or valuables of the guest. By accepting this reservation, it is agreed that all guests are expressly assuming the risk of any harm arising from their use of the premises or others whom they may invite to use the premises. We are a NONSMOKING establishment. This includes marijuana. While it may be legal in Colorado, it is neither welcomed nor tolerated at the Bross Hotel Bed & Breakfast. A cleaning fee of a minimum of $350 will be charged to your card if it is determined that smoking of any kind has occurred in the room. In consideration of our guests, WE DO NOT ACCEPT PETS. In addition, our resident canine, Molly, prefers not to share their guests with other pets. Check-in time is 4 to 8 p.m. Check-out time is 11 a.m. PLEASE BE OBSERVANT OF THESE DESIGNATED TIMES AS WE NEED THE HOURS BETWEEN CHECK-OUT AND CHECK-IN TO CLEAN AND PREPARE THE GUESTROOMS FOR OUR ARRIVING GUESTS. If you would like an early check-in, please call ahead to see if your room might be ready before the regular check-in time of 4:00 pm. Also, if you will be arriving after 8 p.m., please call ahead to make necessary arrangements for a late check-in. Breakfast is served in the Garden Room, most days between 7:30 and 9:00 am. If you prefer to sleep in and skip breakfast altogether or leave early, just let us know the night prior so we can plan accordingly. And lastly, please call ahead or add to your online reservation to alert us of any special dietary requirements we might need to consider in planning and preparing your breakfast items. ******BY MAKING A RESERVATION AT THE BROSS HOTEL BED & BREAKFAST, YOU ARE AUTOMATICALLY AGREEING TO THE ABOVE-STATED POLICIES.